The CRS Series Crane Scale from TOR REY is our economical line of crane scales for overhead material handling and weighing applications for a variety of industrial settings. Ideal for recycling and industrial waste applications, machine repair and rebuilding, shipping and receiving and more! The CRS-500/1000 features a highly visible display which can be easily seen in dimly lit areas. Built to last, our scale features an AC adapter and built-in rechargeable battery with an auto power-off function to save power. The CRS-500/1000 has a capacity of 1000 lbs x .5 lbs – this gives the scale the precision you need to help maximize profits. 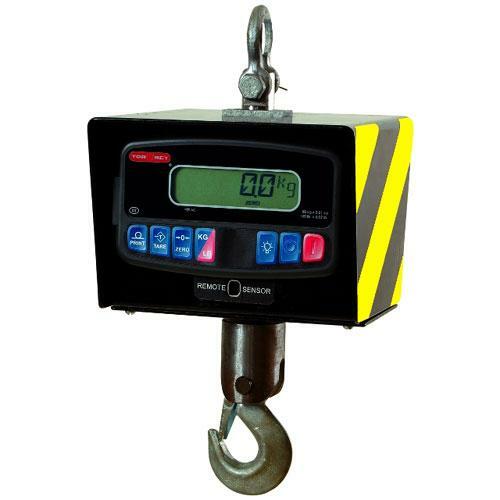 The CRS Series crane scales feature wireless remote control with hold function, gross/net display and overload indicator. The built-in rechargeable battery is easily accessed and offers up to 80 hours of continuous work on a full charge. Featuring durable cast aluminum construction for heavy duty work, the CRS-500/1000 will be a welcomed addition to your business. Whatever your industry – transport and logistics, shipping and receiving, overhead weighing, aerospace, chemical, marine, mining or petroleum industries – the CRS Series crane scale from TOR REY will meet the needs of your business.